To keep your bookmarks private, you have to be logged in in order to access your bookmarks online. 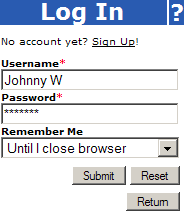 Click on any Login link to open a dialog shown on the picture. Premium members can use secure SSL connection and log in by clicking in the header of the page.